When people discover I’m into healthy, real food I’m sometimes asked if I’m a vegan. If you’ve looked around my website you know I’m not a vegan. The truth is that many years ago, before veganism was as popular as it is now, I was a vegan. The reason why I’m not a vegan anymore can’t be summed up easily, so let me explain. Today there’s a lot of competition and conflict surrounding various health ideals. Health fads come and go. Right now veganism is in style. Just like any other diet, some people will be vegans for life and others will leave veganism when it no longer works for them. I don’t have a problem with that. I know why people choose veganism because at one time it was my choice, too. Currently I follow a diet that is more aligned with Weston A. Price /Traditional Foods . In a perfect world I’d follow either a Paleo /Primal diet or a Keto /Intermittent Fasting way of eating. I don’t believe there is only one healthy way to eat. I believe it’s possible for individuals to be healthier on one diet or another, but I also believe that some individuals can be healthy no matter which (real food) diet they choose. I believe cutting out processed foods and eating at least 80% real food is the number one way to get healthy and prevent disease. Most of all, I believe evaluating how you feel on a diet (after a minimum of 6 weeks, but 6 months is better) is the key to deciding if a diet is right for you. I feel pretty good on a Weston A. Price/Traditional diet. I feel awesome on a Paleo/Primal diet. I feel great on a Keto/Intermittent Fasting diet. I feel okay on a vegetarian diet. I feel horrible on a vegan diet. I’ll be honest, when I first became vegetarian it was for ethical reasons not health reasons. As an empath it was difficult for me to justify killing animals for food when there are so many non-meat food options. Meat has never been among my favorite foods. I do enjoy fish, dairy, and eggs, though. Okay. And bacon. When I faced chronic health issues in my early 30s after eating a Standard American Diet (SAD) for too many years, I knew that changing my diet was the only way I would ever be able to stop taking medication. I knew the drill, too. Low-fat, lots of fruits and veggies, exercise, etc. You know, the usual health info we’ve all gotten since high school health class. While looking for various media to motivate me, I came across a couple of documentaries. Forks Over Knives and Food Matters were the most convincing and after watching them, I immediately began a vegan diet. I told my children how bad animal products were for their bodies and was even able to persuade them to stop eating meat. I was unable to sell my husband completely, but we’d already cut back our meat consumption over the years to reduce our grocery budget and because I was happy with a mostly vegetarian diet. He was willing to eat meat outside of the home only so that I didn’t have to buy it or prepare it. I wore my veganism like a badge. I was proud and noble. But, I wasn’t getting any healthier. I was stuck with a deep, gnawing hunger and yet I wasn’t losing weight. I began to question the vegan lifestyle I’d embraced. “It’s all in the China Study” became my motto, and I reminded myself that all of the answers I needed could be found there. However, my questions about soil quality and how it affects the nutrition of a plant-based diet remained unanswered. Eventually, I posed my question to the right audience and a friend sent me a link to Denise Minger’s website, Raw Food SOS. My friend was unwilling to debate veganism, but clearly disagreed that a diet excluding animal products could sustain health long term. Of course, I thought she was wrong, but I checked out the link. Denise’s website sparked a deep dig into the actual research (finally, my graduate education pays off!) of various studies and what I found stunned me and made me pretty angry. Holy confounding variables, Batman! Does correlation equal causation now? For several months, I sat on the information I gathered, not really sure what to do. I knew that refined sugar and processed foods were bad. I was certain that animal products in their nature-intended forms (grass-fed cows and pastured chickens, for instance) were probably healthy to consume. But before I gave myself and my family the green-light for wanton animal-product consumption, I needed to be sure. I googled Denise’s name and found a couple of new articles/blog posts written by her, detailing the flaws of The China Study. I felt silly for not listening to my intuition and making an emotional leap into veganism. One of Denise’s articles was on the Weston A. Price website and after reading it, I hung around and read several other articles. And that’s when it clicked for me. I began reading Nutrition and Physical Degeneration and Nourishing Traditions , followed by Pottenger’s Cats . I dove into Death By Supermarket and eventually Eat Fat, Lose Fat . Performing Google searches for real food information brought me to Mark’s Daily Apple. Within months my family was drinking raw milk and I was apologizing to my kiddos for passing on bad information and setting the record straight about animal products, much to their delight. Real Food is Healthy. Period. Don’t get me wrong, I never went back to a Standard American Diet of processed foods, heavy on sugar and grains. Our diet changed drastically and many of the changes we made were similar to the changes that vegans make. In fact, I’m probably pickier about food as a real food omnivore than I was as a vegetarian or vegan because I know that I have to eat more than nutrient-depleted, conventionally grown vegetables and hyper-sweet fruit hybrids to survive. And don’t get me started on grains. I don’t dismiss grains as easily as, say, a strict Paleo real foodie, but I’m not going to feed my family with any old store-bought breads and crackers. Within three months of transitioning to a real food diet that included daily animal products, my chronic health issues were gone. My IBS was cured. I only get headaches when I eat gluten-containing, conventionally-prepared, industrial-food-chain wheat products (soured, sprouted and soaked wheat do not bother me). My blood pressure is normal, my heart palpitations and chest pain have disappeared. And the anxiety I experienced for years was gone. Oh, and I lost 50 pounds. While eating fat. Lots and lots of fat. Saturated fat. From animal products. It’s just fine that I’ve found a diet that makes me feel great, but many people don’t turn to veganism for health reasons. Many vegans chose their lifestyle for carefully considered ethical reasons. Don’t I care about the animals who have to die or be bothered to support my barbaric need for the food they can provide me and my family? I hear you. I’ve flirted with vegetarianism most of my life and fully supported my oldest son when, at age 7, he decided that killing animals for food was a horrible practice and became vegetarian. I was glad to have another vegetarian in the family. So what has changed for me, an empathic animal lover? Actually, I do agree with vegans that the way animals are treated in the industrial food chain is disgusting and heartbreaking. I believe animals and the food they provide for us are sacred. I believe that the wholly unholy industrial food chain is a mockery of nature and a disgraceful misuse of the same. For this reason, I have reduced my family’s overall meat consumption. I buy meat from local farmers who practice traditional and humane animal husbandry. I can see myself eating meat just a few times a year after my children are grown and I’m no longer cooking for a family. On the other hand, I don’t feel any guilt over drinking milk from happy, pastured cows, eating the eggs of healthy, pastured chickens, and consuming the meat and fat of animals who are treated well and cherished like the noble beings they are while they are living. I Don’t Hate Vegans. I Admire Vegans. I think that most vegans have their hearts in the right place. All of the vegans I know are loving, caring individuals who believe that they’re on the right path when it comes to health. In fact, I admire their against-the-grain way of thinking. Anyone who challenges the status quo, has my respect, even if we disagree. I echo others in the real food movement who advise vegans to follow their spiritual beliefs about veganism, but not during child-bearing years and not before the body and brain have finished developing. Yes, I respect the spiritual aspect of veganism, but the truth is that several other dietary changes are responsible for an increase in energy and health that vegans initially feel. I believe that anyone who stops eating CAFO meat, eggs, and dairy will see an increase in health. If those same people stop eating vegetable oils, conventional grain products, and refined sweeteners, they will be on the right path to optimal health. However, it is unnecessary to stop eating animal products altogether, but instead to choose animal products from sources who use ethical animal husbandry practices. I can get behind the moral and ethical objections to eating meat that vegans use to support their position. I understand that the killing of peaceful animals for meat seems cruel. I don’t share that belief, but I understand and respect it. 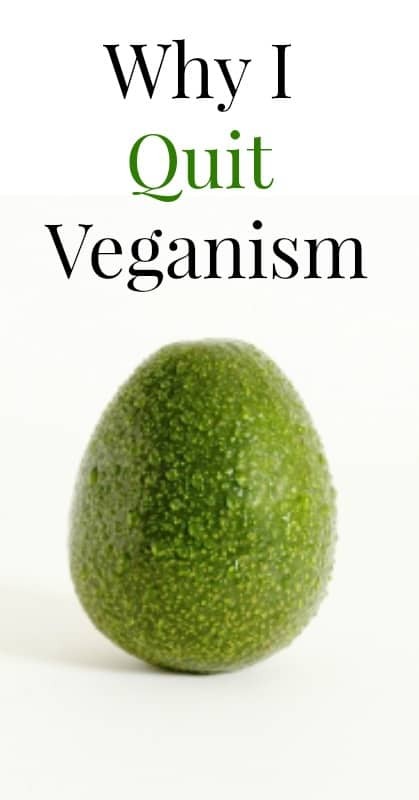 I don’t agree with the belief that veganism – especially raw veganism is optimally healthy for omnivores. It takes a lot of research, thought, preparation, and follow through to be a healthy vegan. If you have what it takes, go for it! If not, you may end up like the author of The Vegetarian Myth . In the end, we all have to make the best decisions we can based on the information we have available. I’m incredibly grateful for the work of Weston A. Price and others who have shown us what an optimally healthy person looks like and what an optimally healthy person eats in order to stay that way – and the role that animal products play in achieving optimal health.